The Master of Science in criminal justice is a professionally oriented terminal Master’s degree offered completely online. 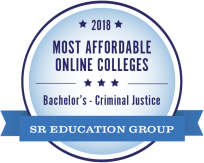 It provides students with advanced academic training, special expertise in advanced issues within the criminal justice system, supervisory and administrative proficiency, and the methodological and statistical skills necessary to understand research and new developments in criminal justice. Graduates of this program will gain applied knowledge enabling them to rise toward the highest levels in criminal justice organizations. If you are considering pursuing a Ph.D. following completion of this degree program, you must enroll in the Master of Arts in Criminal Justice. This program will not qualify you for admission into the Ph.D. program. Up to six hours of credit may be transferred into the program, with a limit of 12 hours allowable under unusual circumstances. Transfer credits must be agreed upon by the program coordinator and the student prior to enrollment and appropriate paperwork must be filed with the graduate school. The Master of Science Degree is a 36 hour degree, including 18 hours of required courses and 18 hours of electives. The required courses include Policy Prep and Capstone in which the final project is completed. An oral defense of the final project is required. Courses with grades of B or better may not be repeated; grades below C are not accepted in the minimum hours requirement; and courses cannot be dropped from the study plan because of low grades. Students who are conditionally admitted must earn grades of at least a B in the first 12 hours and may not receive a grade of (I) incomplete.